This is one of my favorite, comfort foods if you wish. 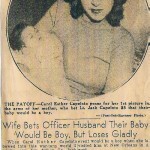 26 years ago when my oldest son was a baby I used to cart him around in his infant seat during the day and attend cooking class at the now defunct Montana Mercantile store and cooking school in Los Angeles. The cooking school fostered in me a love of fresh food while teaching me technique beyond what I had learned at home. 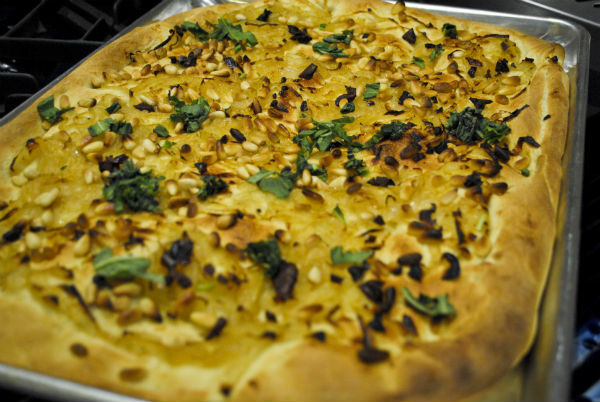 Pissaldiere is a classic French dish and is often called Provencal Pizza. The crisp pizza-like dough pairs wonderfully with the salty-sweet mix of caramelized onions, pine nuts, cured olives and anchovies. Add the yeast and honey to the warm water then add the olive oil. Place flour and salt in a processor work bowl. 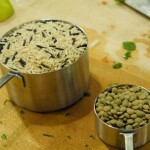 Pulse the processor once to blend in the salt. 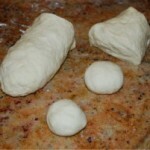 Next add water, yeast, and oil and process until you have a soft ball of dough. 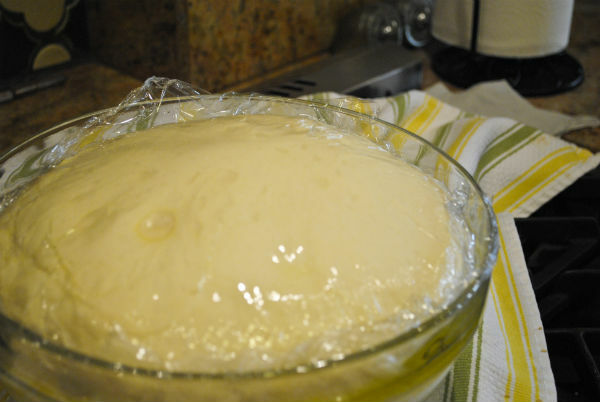 You can make this dough by hand, knead for ten minutes, or make the dough in a mixer. 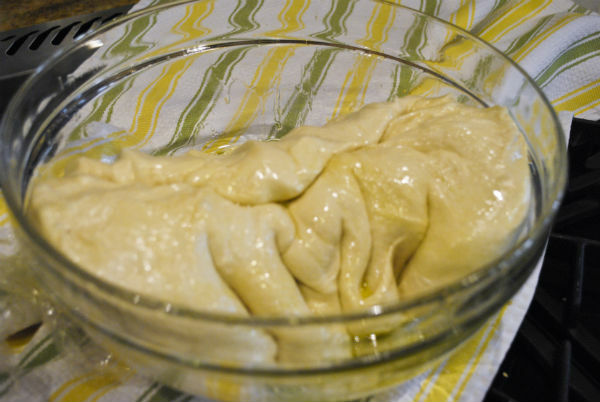 Place the dough in a bowl and drizzle a little olive oil over the top. Cover the dough with a tea towel to rise until double. I always double this recipe in order to make more. Preheat a large sauté pan, add two tablespoons of olive oil and then sauté onions slowly for about 45 minutes or until they turn a rich caramel color. Slice the olives into small pieces. Slice the anchovies lengthwise into thin strips. When the dough doubles in bulk after about 1 hour, punch it down. 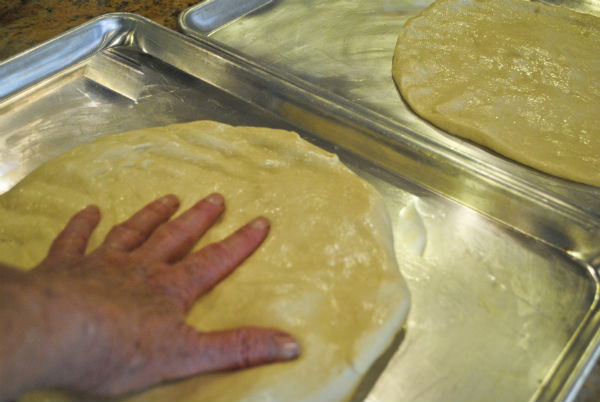 Let the dough rest a few minutes and then roll it out with a rolling pin or use your hands to stretch to fill a large baking sheet. Alternatively break the dough into 4-6 balls for small individual pizzas. 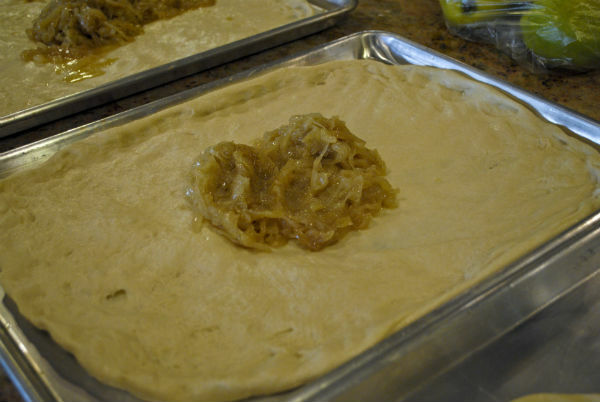 Once the dough is the desired size, assemble the Pissaldiere. 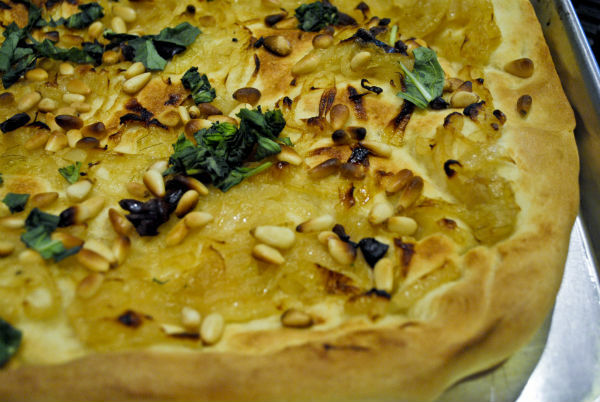 Top the dough with the cooled caramelized onions, chopped olives, pine nuts and basil. If you are using anchovies place them in a design over the Pissaldiere. Now grate a bit of parmesan cheese over the Pissaldiere if you wish. Bake Pissaldiere in a preheated 450 degree oven until golden brown. 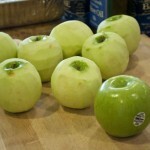 Remove and slice. You could also add feta or goat cheese. I usually make Pissaldiere without the cheese. I love to serve it cut up into pieces as a hors d’oeuvre, appetizer, or side dish at summer barbecues. This dish is also wonderful on a brunch buffet. 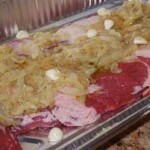 Now that Mother’s day, Father’s day, Shavuot and the summer barbecue season is starting make some ahead just slightly under-baked and freeze them ready for your parties. Thanks for sharing this, Linda. I can almost taste how delicious this is by looking at these photos.